Bill Leeb is joined by new permanent member Chris Peterson to make up the core of the hard edge aural assault of Front Line Assembly. 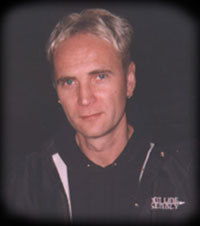 After their intense Salt Lake performance on November 8th, 1998, Bill Leeb was persuaded to come to the KRCL studio for an on-air interview during DJ Alan Moss's industrial show, Cranial Circuitry. Alan: Front Line Assembly was kind of your first project where you were really in control. How do you decide what projects you want to work on and which direction you want to head with your music? Bill Leeb: I feel like I just wake up some days and want to do something completely different. I never wanted to limit anything I did, so I would just start a new thing and put a new name on it. I think that's why electronic music is so interesting, because there's no limits. One person alone could be a whole band. I think that's always what excited me. The possibilities are unlimited as to what you can do with technology. I think it's a learning process; and I enjoy the learning process. So as that continues, it keeps my interest. Who knows? I think the whole soundtrack thing is going to be something I'm going to want to focus on as the years go by. Alan: Do you plan on doing more soundtrack work in the future? Bill Leeb: Yeah, I just did a couple of films. One is a strange little Hollywood film called Convergence starring Christopher Lloyd. I used the Delerium heading for that. I used the Synaesthesia heading for one called Gutted in Chocolate. It's kind of an art film about two girls who come of age and find out that they like each other more than men. It's going to debut at the Berlin Film Festival. We're also doing the soundtrack for the new "Quake III" game, so I've got my hands full. I think it's just the beginning of a whole new phase for me. Alan: You've done so many things, do you have a project that's a favorite? Does one thing stand out more than another? Bill Leeb: I guess the thing about having Delerium and Frontline is the extremities. Even though they're both technically related, Frontline is as hard as nails, and Delerium is a spiritual kind of record to me. It's something that you put on, and it enhances the environment around you and actually makes you feel better. I think everybody needs different sides of their personality to be a complete person. I think I need both of those to sort of adhere one to the other and make sense of everything at the end of the day. Some days I want to scream; and some days I just want to pray. Having those is a perfect outlet for that kind of thing. Alan: Is there anyone that you'd really like to work with in the future, maybe pursue another project? Bill Leeb: That's kind of a hard question. I think I'm already kind of aspiring to that with Delerium by having Sarah McLachlan and Lisa Gerard. I'd like to get them on the new album. I would still love to work with Elizabeth Fraser of the Cocteau Twins. I love her voice. There are people I look up to, but I think at this stage in my career, I kinda want to go at it alone. Alan: How has it been working with Chris Peterson? Bill Leeb: Chris is like the noisemeister. He's kinda been there all along. When we did the first Tactical Neural Implant tour, he was there as a percussionist. He helped mix the first Noise Unit and some of the older Delerium. So he's always been in the picture. It was kind of an easy step over. He had hard shoes to fill, with Rhys going off to do some other things, but it's working okay. For now, I'm liking what's going on. Alan: Any plans to hook back up in the future with Rhys? Bill Leeb: We left that really open; we didn't close any doors. It wasn't like a personal thing, so I'm sure something will develop again one day once we both feel like we've had a bit of space to try things out. Alan: When you get ready to record, do you go through any kind of creative process to write music? Bill Leeb: We have our own studio called Cryogenics studio. We had a massive amount of gear, old and new. We'd just sit there and play all day and try to write songs. I always say, "I'm going to work," but other people always say, "You call that work!?" I couldn't imagine doing anything else. I mean we put a lot of time into it. We write everything first, then once we're finished, we'll go to a bigger studio and use Greg Reely to mix it. I think sound quality and definition is a big thing these days. 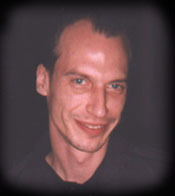 Alan: Back when you were working with Skinny Puppy, was there a reason you decided to change your name? Bill Leeb: Actually, my real name is Wilhelm. Schroeder we picked out from the guy playing the piano in the Charlie Brown cartoon. Kevin said, "Hey, you should call yourself Wilhelm Schroeder," cuz it was cEvin Key and Nivek Ogre, those weren't their real names. That was more of a joke thing. Alan: There's always mention of the Green Guy, who is that? Bill Leeb: Well, you know, the Green Guy is Mr. Marijuana. Nothing ever got done without him. There always had to be a huge bag of something sitting on the control board. That was aptly rolled up and smoked before any creative juices started to flow. Alan: Did you have problems created by some of the other people's drug useage, with heroin and stuff like that? Bill Leeb: I've never done it. I recommend that nobody else do it. There was some horrible things that happened to some of our friends and working colleagues. They're gone and nothing's going to change it, so I think that's a nowhere road. Alan: How is the tour so far, have you liked the venues you've been to? Bill Leeb: There's been some strange ones, but for the most part it's been really good. I'm always just surprised to see how many people still come out and see us. Now that I don't have Rhys working with me, I wanted to see how it would work with Chris. It's working okay. Chances are, next year we'll do a four week tour, go to the east coast if we have time. Alan: What do you plan on doing when you get back to Vancouver? Bill Leeb: The guy from Quake has been calling me every day like, "Where's my song? Where's my song?" We have to do that, and we have to do a Delerium album, which is gonna be a pretty big undertaking. I have to find inspiration for that. Alan: What's the time frame on the Delerium album? Bill Leeb: I'm sure it'll take at least 7 or 8 months. The last Delerium album, we actually hired choirs and recorded them in the church. We got all the music and the Latin transcribed and recorded. It was a big undertaking. Alan: Well, it's about time to wrap this up. Thanks a lot for coming to the radio station and to Salt Lake. Bill Leeb: We'd like to thank all the people that came out to see us. We're looking forward to coming back.